Official Proclamation of the first Kamehameha Day Holiday, 1872. By the Blessings of God, We, Kamehameha V., the King of the Hawaiian Islands, through this, proclaim that it is our desire and pleasure that from here forth, the eleventh day of June, of every year will be a Holiday to memorialize Our Grandfather and Our Progenitor, Kamehameha I., the one who founded the Nation of Hawaii. Given at Iolani Palace, by Our hand and Great Seal of Our Nation on this 22nd of December, 1872. Ke Au Okoa, Buke VII, Helu 37, Aoao 2. Dekemaba 28, 1871. 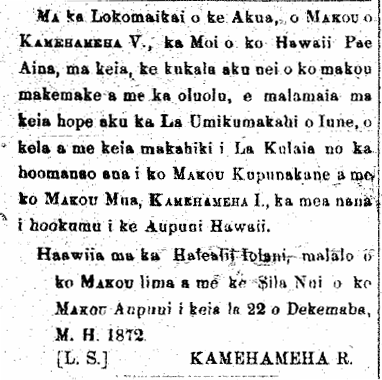 Announcing the first Kamehameha Day, 1872. National Holiday.–According to the spokesman of the nation [Ke Au Okoa], seen under the heading, “By Order,” was proclaimed the word of the king that the 11th of June every year will be observed as a national holiday to memorialize Kamehameha I, the King who unified the kingdom into one. It is not known whether it is his birthday, or whether it is the day that the islands of Hawaii were united under his rule. Time will clear up the confusion. Ka Nupepa Kuokoa, Buke X, Helu 52, Aoao 2. Dekemaba 30, 1871. 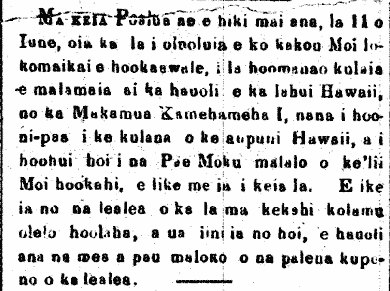 More on the first Kamehameha Day, 1872. On this upcoming Tuesday, the 11th of June; this is the day which pleases our benevolent King, to set aside as a memorial holiday where the Hawaiian people should rejoice in honor of the progenitor Kamehameha I, who established the Hawaiian nation and who united the archipelago beneath one King, as it is today. The festivities of the day can be seen in the announcements column and it is desired that all enjoy themselves within the proper bounds. Ke Au Okoa, Buke VIII, Helu 8, Aoao 2. Iune 6, 1872. On this past Tuesday, in accordance with the royal proclamation, the 11th of June was celebrated as a day of remembrance of Kamehameha I, the Royal Ancestor who conquered our aina. This is a new day included in the circle of holidays, and the minds of the populace are happy about this type of day set aside to remember our cherished one of days gone by. The day dawned beautifully; there were no droplets to interfere with those who skillfully took care of the day. From early morning the doors of the shops of the town, both large and small, were shut. And when the sun came all the way out, there were not many people seen on the streets of town, and the great work places were deserted. 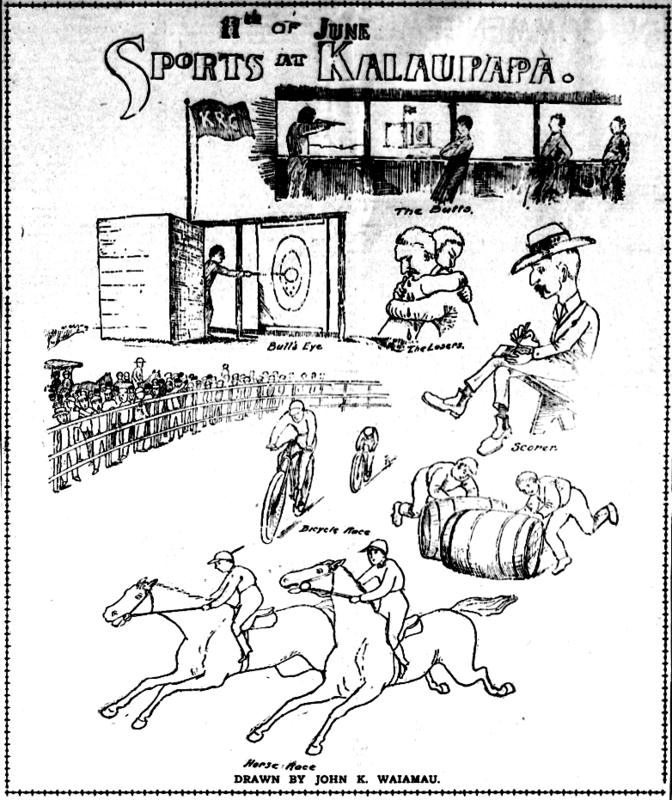 All things meant to entertain themselves were prepared—some people made parties while others rode horses; however, it seemed as if most of the people were all at the races organized at Kulaokahua, the usual place for all types of entertainment. The atmosphere of the race tracks that day seemed better than all previous days. Lanai and tents were set up impeccably, and those that undertook that task received much appreciation. The lanai, fields, and hills were filled with thousands who amused themselves with the events of the day. If an observer stood and watched from afar, it was as if he were seeing a picture of a race day somewhere like in Europe. The events of the day started at 10 or so, and after watching all the day’s activities, it was truly wonderful. There were no great commotions to disturb the peace among the crowd–this is something unfamiliar on special days like these. At 10 o’clock sharp, Queen Emma arrived with her guests, and King Kapuaiwa with his entourage. At the appearance of the King, the activities of the day commenced, and all of the crowd joined in the gaieties that were set up. Below, you will find the races and those that won. The final race, the wheelbarrow race was the most humorous. This entertainment marked the close of the festivities of the day. And everyone left with hearts filled with much glee. We are greatly pleased with one thing, and that is the decrease in the number of outbreaks of various sorts. There were no big riots thought to be related to the events of the day. John K. Waiamau, the artist, 1904. DRAWN BY JOHN K. WAIAMAU. Hawaiian Gazette, Volume XXXIX, Number 49, Page 5. 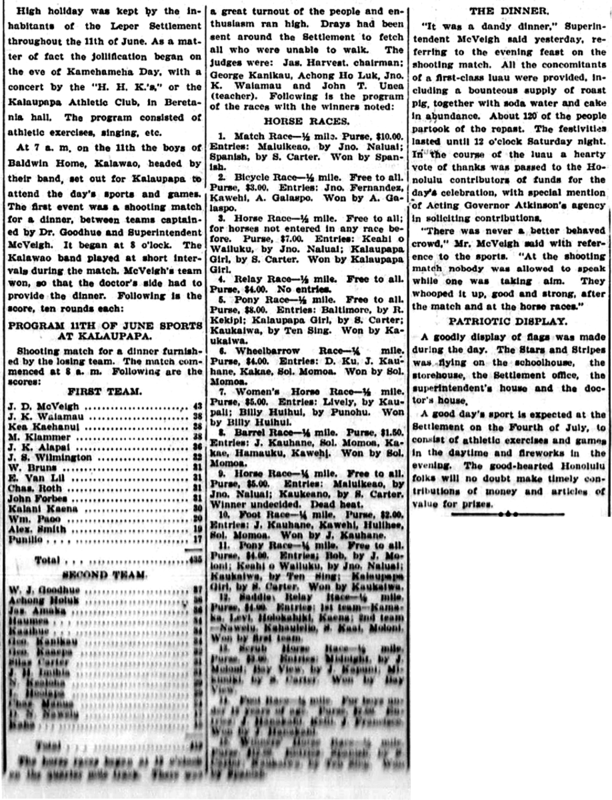 June 17, 1904. 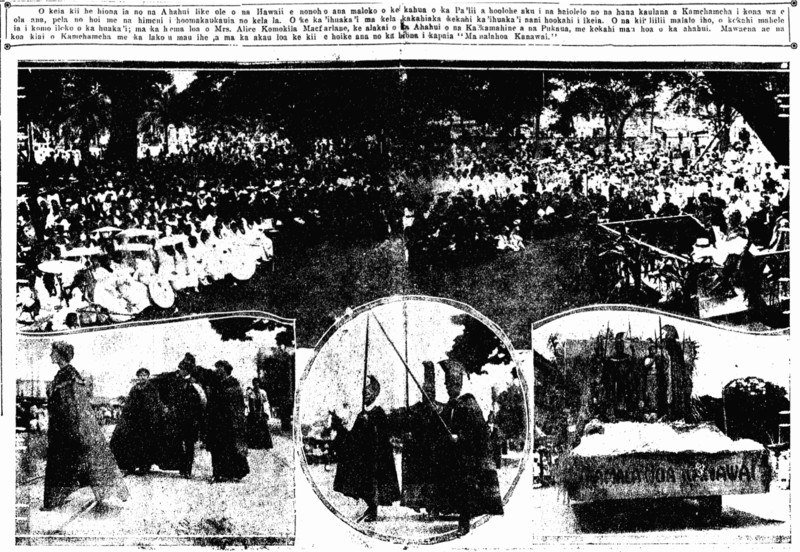 Scenes from the Kamehameha Day celebration, 1919. 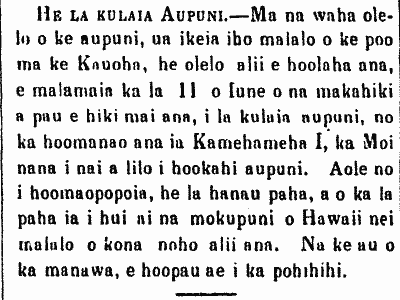 Ka Nupepa Kuokoa, Buke LVII, Helu 24, Aoao 1. Iune 13, 1919.